I am not sure why I have not been getting notifications of this thread to answer any questions. I am not dodging anything but just didnt see them until Marc texted me and let me know to come on and respond. I do not get on here at all much lately because of time. I know it is getting old to say we are waiting on anodizing but that is what is going on. Unfortunately to get the glossy black it is very hard to find someone to do it. I had someone lined up and got a sample back. It looked good so I was going to go with them. Unfortunately because of timing (my fault), I am not able to use them now. I have found another company that does glossy anodizing (bright coat is what they call it) and I am going to send them a sample. I was supposed to send it a couple of weeks ago but we couldn't get everything arranged to where I felt safe sending it (I basically want a name I can send it to so it doesn't get mixed up and lost). I hope to have it sent out this week though (still working with them) or first of next. Once I get that sample back I will move forward with getting the rest of them done. I cant apologize enough for it taking so long and I take full responsibility for it but it is nearing the finish line. I already have the chassis ready to go so the only thing remaining is the anodizing. 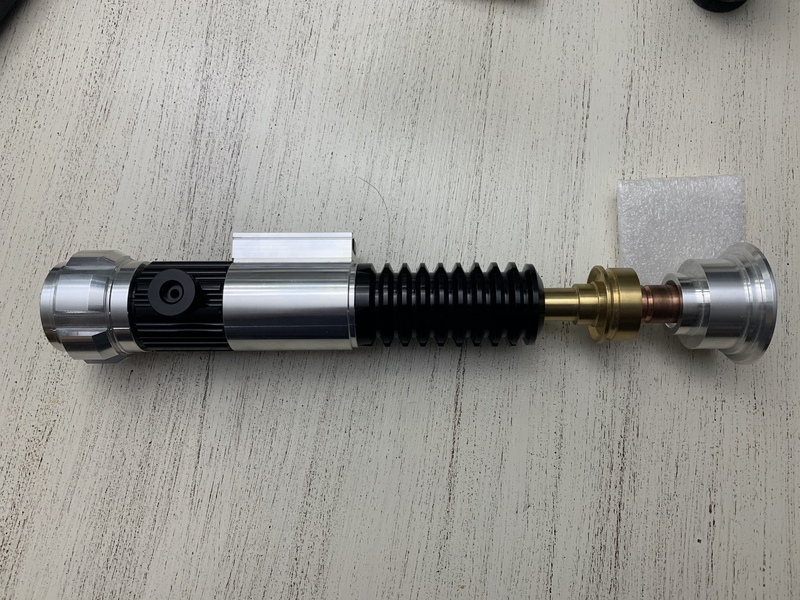 It is possible for the anodizing to be done fairly quick according to their turn around time I was quoted so I am hoping they go to the installers at least by next month. if anyone ever has a question that I do not answer on here then feel free to email me (the email icon is under my name) and I will be glad to answer. Again I apologize for not seeing any questions or concerns on this thread. I will post a pic of the sample from the last batch and the chassis when I get a chance in the next day or so. who should I talk to about being able to sell my spot on the run? Just PM LDM and see how much you paid and then you can offer it for sale for that and let them know the remaining balance they need to put toward it later. Any chance you'd happen to have any pics of that aforementioned sample? I just got the sample from the new anodizing company in today. 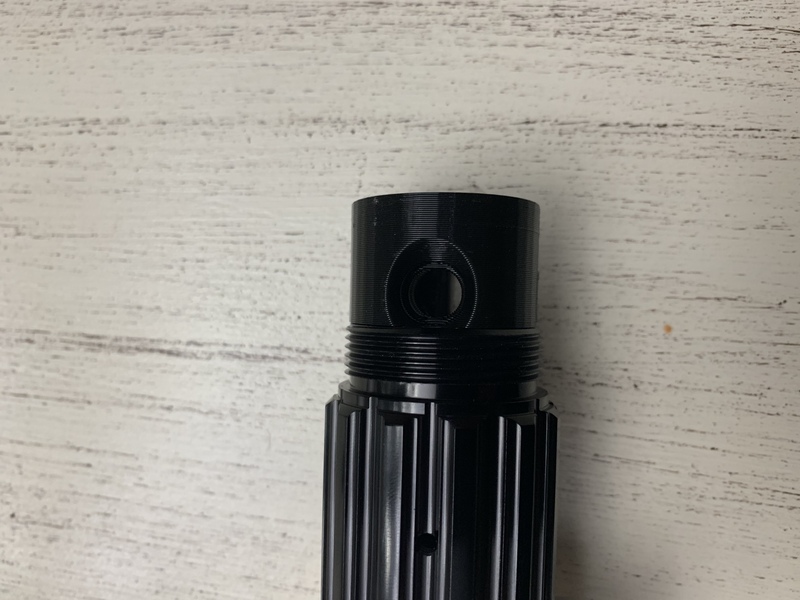 They are a nice gloss level though not as glossy as super black powder coat but I just do not think I can find anything like that in anodizing. However they do have a nice gloss level (the pic really doesn't do it justice) and it is a nice deep black color and not at all purple like some black anodizing I have seen (under fluorescent lighting). below are pics of the saber. The parts are not aligned in this pic because the silver pieces do not belong to the grenade and gear section (I didnt see the need in digging through all the pieces to get the correct silver parts just for pics). I am also including the chassis pictures. 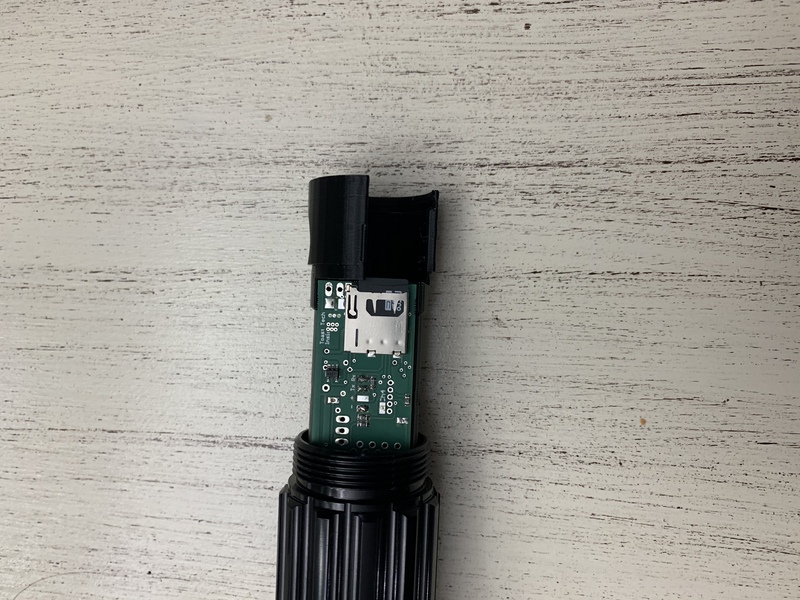 It will allow access to the SD card by taking the pommel off. The kill key will also be under the pommel. I am pleased with the Anodizing company and will be sending them the rest of the pieces. They originally told me it was a two week turn around so hopefully I can have these all back and ready for installs sometime in November. If anyone is interested I would be open to selling my spot. Just wondering what electronics will be in these? And yes alike the last poster asked any news on these? Post one says they will be installed with the latest CF, when installs begin. What are the next steps left here? We haven't been given a meaningful update since the end of October. I know Real life can take over. but anything would be better than nothing. Are we going to see these? Has anything happened since October? They originally told me it was a two week turn around so hopefully I can have these all back and ready for installs sometime in November. Are they anodized? Have installs started?